Nearly 24 million people use Hulu every single month and those users account for more than 1 billion video ads across the company’s network and now Hulu is utilizing their large advertiser network to provide their visitors with more advertising options. With ads appearing nearly every 4-and-a-half minutes the Hulu Ad Selection (ASq) is an advertising format system that provides pre-roll ads with never before seen user control. 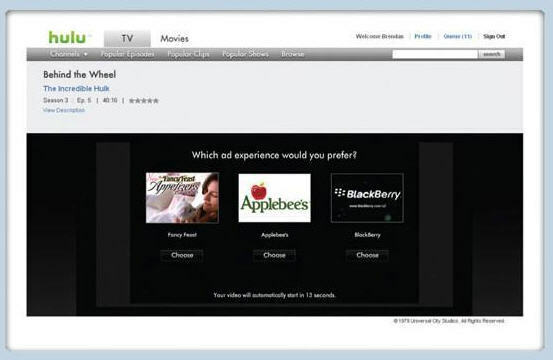 When users attempt to watch a TV show or movie on the network they are provided with two to three advertising options which include choices in brands (shown above), brand categories or commercial length. Users simply choose the content they want and sit back to enjoy their shows. What do you think about Hulu’s ad selector? I personally love when I have the option to watch a longer commercial to receive less future interruptions, although with the limited number of commercials on Hulu as it is, I don’t mind any option presented to me.